This generation of students does too, just not long ones. They love learning about God, but many cannot not hang with Piper, much less his predecessor, Jonathan Edwards. We live in a world where we shop and pay with a click 24/7, we get ticked when we can’t access our email at 30,000 feet, and we can Google anything to become informed about everything. Stimulation saturation and the “gotta have it now” have killed our attention spans. So when it comes to God, how can we tell the story of the life He offers and calls us into without being trite and shallow? How can we draw students into discipleship relationships with Jesus and train them effectively to reproduce that in others? I know what you’re thinking, but give me a chance. The best disciple-makers I know have many things in common: love for Jesus, strong character, daily walk with God, knowledge of the Word, love for others, and a life that matches what they teach. It helps tell the story of a great truth. You unfold it. You work in your experience and story. It’s a way of personalizing truth. You interact. This is not a monologue. Almost none of my students remember my eloquent expositions of Ephesians. No, there are questions, answers, discussions, clarifications, even other illustrations if need be. You leave them with something. They take it with them. Look it over. Learn it. Share it. Retention is increased when truth is heard and seen. It can be as simple or as complicated as you like and have time for. You could do it 5 minutes or 45 minutes, depending on the context. It’s transferable. Simple sketches can be reproduced simply. This is one of the greatest advantages! 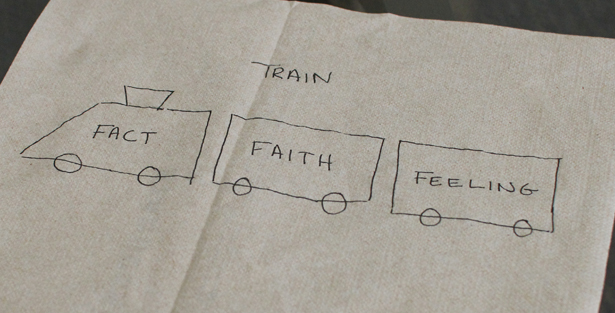 We can all remember some diagram someone shared with us that really helped us grasp a truth and share it with others. Here are some of the classics that have long illustrated great Biblical truths for believers. Abbreviated here because of space, with links to more thorough explanations. As a bonus, I will throw in one new one that will help your students start living as world Christians. The essentials of what a person must believe to enter into a relationship with Jesus. Use this part of the diagram to illustrate that although God loves us, sin separates us from God, resulting in judgment and death both now and forever. We cannot fix ourselves or bridge the gulf that separates us from God. No matter what we try to do, whether it be good deeds, good morals, good education or good religion, we need a Savior. 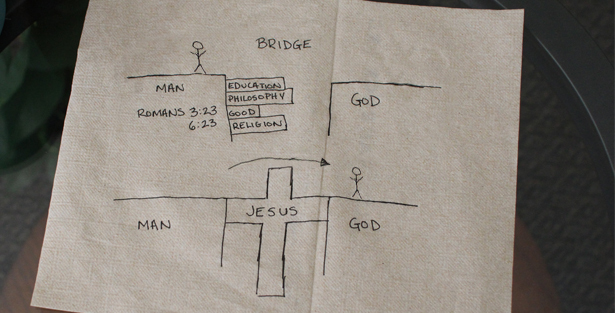 Use this part of the diagram to show that only Jesus can bridge the gulf between God and man. He had to die to pay the “wage” for our sin (judgment and death) that created the gulf. But He did not stay dead. He rose from the dead, conquering sin and death. He came to save all men, but not all are saved. Every person has a choice to make: to follow Jesus or not. We trust and believe in who Jesus is and what He did for each of us. We receive His gift of salvation by faith. He makes us new, restoring us to God, and helping us live out God’s purposes for our life. A proven method in communicating the gospel–succinct and memorable. You can even use one memorized Bible verse (Romans 6:23) to back up your illustration with Scripture. It is not comprehensive (but you can change that), can seem impersonal or canned (if presented mechanically), and can reduce the world’s greatest truth to a few principles. To explain the relationship of truth (fact), faith, and emotion (feelings) in the Christian life. It explains the preeminence of Scripture in the Christian life and that our faith and feelings must be brought into alignment with God’s truth. Our experience is usually not this linear or this compartmentalized. God usually does not fit into our boxcars. Demonstrates why many believers struggle with sin, bear little fruit, or long for something more in their relationships with God. This diagram relates the importance of the Holy Spirit, the lordship of Christ, and faith to daily living and overcoming sin. First Circle: When people invite Jesus into their lives, they often struggle with sin or have areas in their lives they are not ready to give to Christ. They sit on the throne of their lives calling the shots. The Bible describes this behavior as “living according to the flesh” (Galatians 5:16, Romans 8:5-8). This leads to a broken, powerless, frustrating Christian life, void of much fruit. Second Circle: This person follows Jesus in faith-filled obedience, allowing themselves to be led by the Spirit in every area of their lives, moment by moment. Jesus calls the shots. The Bible describes this person as “walking in the Spirit” or “filled with the Spirit” because we are under His influence (Ephesians 5:18). This person is characterized by greater intimacy with God, more Christlikeness, powerful over sin and effective in ministry. This is a great truth most believers miss. This generalization is almost never someone’s entire life, but usually just moments of sin or areas of his or her life that are not yet submitted to Christ (or need to be yielded again). 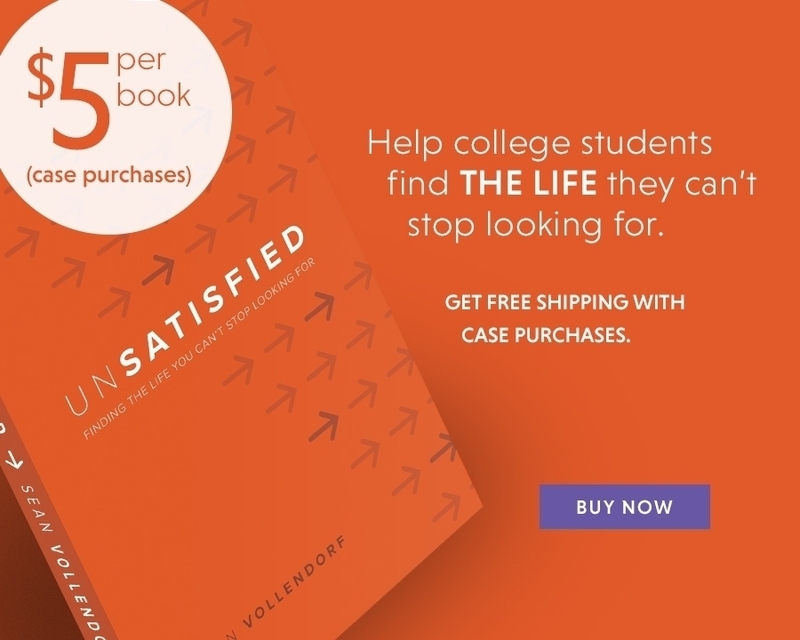 This is a great place to start for someone new to the faith. Are there more ways to grow? Yes: worship, fasting, engaging with God’s global mission, accountability, etc. This is not exhaustive but covers many basics for Christian growth. This expands one spoke of the wheel, the Word, and explains different ways we can learn from God’s Word. Draw a hand or trace someone’s hand. Explain: for us to really grasp God’s Word, we must hold on to it with all 5 fingers. 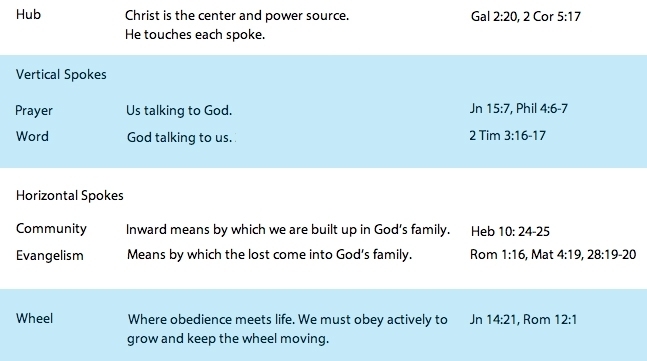 There are 4 ways we can study God’s Word and 1 way (thumb) we can reflect on what God is saying to us in each of the 4 ways. Each one is more in depth and requires a bit more effort. Covers the bases for a thorough approach to God’s Word to get the most out of it. It shows that little effort yields little result. To be a faithful student of God’s Word, it will require all five methods. This shows the need and power of a disciplemaker. Open with the question: Would you rather have $1000/day for 30 days or .01 a day doubled each day for 30 days? (Answer #2: $5,368,709). Read 2 Timothy 2:2. Draw the diagram and explain the difference between spiritual addition and spiritual multiplication. Point out the 4 levels of Paul’s discipleship network. Illustrate again by tearing a piece of paper in half, then again, and again, and again. Ask, “how tall would this stack of paper be if I did this 46 more times?” (Answer: from here to the moon.) That is the power of multiplication and why every disciple must reproduce. Follow up questions: What is the problem with addition? How do you think adding disciples affects the church or the Great Commission? Why is reproduction so necessary? How long would it take to disciple the nations if every Christian taught two people to reproduce in 1 year? What is the DNA of a reproducer? Reproduction and multiplication are key concepts that are missing in most discipleship. Every Christian is called to live as a World Christian. You can use this to introduce students to key World Christian concepts and to challenge them to begin living for God’s global purposes. Ask, “Have you ever heard of the World Christian lifestyle or a World Christian?” This is simply a Christian who has a global perspective on their Christian life. Then draw the window. Put a ‘5’ in 3 of the panes. Then put “Word, world, work” in 3 of the panes, explaining a World Christian is growing in these three areas. Explain how God has given every follower of Jesus a “window” of opportunity to be involved in His global purposes. God’s Word- Ask them if they know any verses that deal with mission or with the nations. Write down (and read if you can) 5 Commissions: Matthew 28:19-20, Mark 16:15, Luke 24:47, John 20:21, Acts 1:8 OR Genesis 12:1-3, Psalm 46:10, Matthew 28:19-20, Galatians 3:14, Revelation 5:9,7:9. God’s World- In light of God’s Word, a World Christian desires to know the task remaining to reach God’s world. Write the ‘10’ and ‘40’ of the “window” and explain the 5 types of unreached peoples: T.H.U.M.B. (tribal, Hindu, unreligious, Muslim, and Buddhist). 90% of the unreached live within this window, yet only 10% of missionary effort and less than .1% of giving goes there. God’s Work- In light of God’s Word and the needs in God’s world, the World Christian is engaging in God’s work. 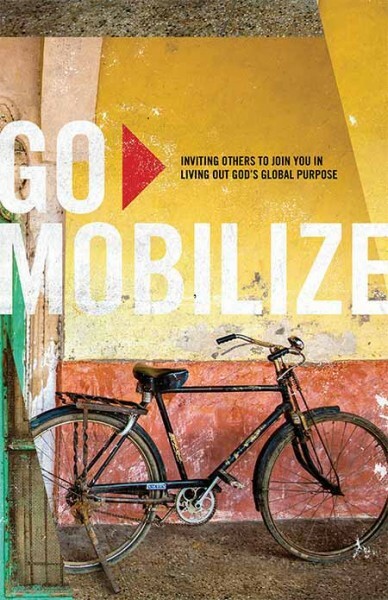 Explain the 5 habits of a World Christian: go, send, welcome, mobilize and pray. Give them ideas for what that might look like for them. In the last pane of the window write a question mark and draw a person on each side of the window: the Christian on one side and World Christian on the other. Ask them to indicate where they are between the Christian and the World Christian lifestyle. Then ask, “What are some ways you could live more of the World Christian lifestyle?” Write these in the last pane. Suggest some resources that might help and maybe another meeting to help them explore the idea more. Illustrates an almost unknown aspect of making disciples, allows for a decision and next steps, lifts the vision for their Christian life to a global one, gives 5 practical ways they can be involved in reaching the nations. Takes at least 10 minutes.